If you were looking for a distraction from the chaos resulting from Tuesday's election of Donald Trump as president on Wednesday night, you’d have found it at the Fillmore Charlotte. The Fillmore played host to one of the hottest acts to emerge on the scene in recent years and gave people something akin to hope after a devastating election the night before. Fitz and the Tantrums completely took over the Queen City without uttering so much as a word between songs. The band made a name for itself as one that can unite fans from all walks of life. That was evident, judging by the crowd packing the Fillmore Charlotte last night. The audience was full of people aged from 16 to 60 who showed up to fill the club in anticipation of the indie group’s set. Families could be seen taking selfies as all ages waited for the show to begin, eager for a fun release following an exhausting past 24 hours. From the moment the band graced the stage to the encore, every single member of the audience was completely immersed in a frenzy of screaming, singing and — above all — dance. “Clearly this isn’t a show for wall flowers,” lead singer Michael Fitzpatrick said between songs, as co-singer Noelle Scaggs egged him on. Despite the generational gap and difference in temperament of their loyal fans, Fitzpatrick was right — every single audience member raised their hands and stomped their feet in time to the music at the singer's slightest coaxing. It didn’t matter if they were playing old favorites like “Moneygrabber” or songs from the new album like “Tricky” and “Roll Up,” the crowd was in the palm of their hands and completely into each and every track they played. It’s rare to see an act command an audience like this. Fitz and the Tantrums have it down to a science, able to bring a crowd to their feet with even a subtle beckoning or have them waving in unison while the group is getting their groove on. The band brought a fun atmosphere to a crowd desperately in need of an escape from reality and flawlessly played through a fun set that captured the essence of a time when pop-synth ruled the airwaves. 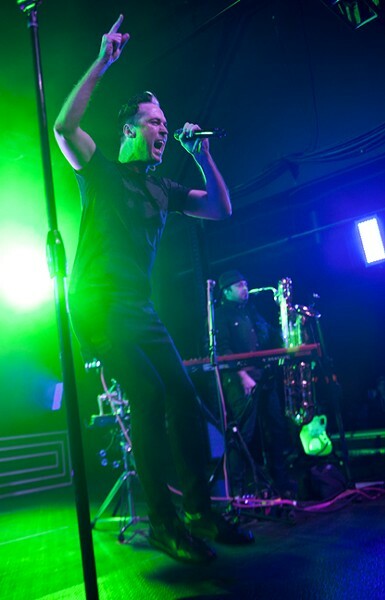 Next time you’re looking for a fun escape from reality, see if Fitz and the Tantrums are touring near you. They’re guaranteed to give you a musical escape that will encourage you to leave your inhibitions behind.